When the summer comes, you may find yourself fending off swarms of all sorts of flying insects: flies, mosquitoes, and moths, just to name a few. It goes without saying that, besides the discomfort, mosquitoes can also be vectors of serious diseases. A screen door is one way of keeping these pests out. You can find hinged screen doors, which you have to install on an existing kitchen door. There are also sliding or retractable screen doors. 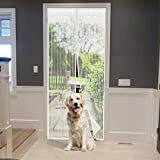 Most recently, companies have been making convenient screen doors that require a minimum of installation--they can be attached and detached with just Velcro strips. Hinged door: This is a permanent fixture to your home. It is a screen inserted into an aluminum or wooden frame, that is on a set of hinges separate from those of the door. The screen is held in place by means of the door handle, as well as a rubber spline. 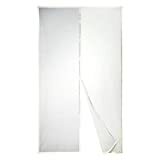 Sliding screen door: These can either slide on a set of runners, or be retractable screen doors, which slide into the doorpost and wall. ODL makes the Brisa Retractable Screen Door, which slides invisibly into the doorpost. 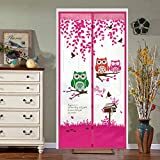 Magnetic screen doors: This is not a “door” per se, but more like a partition that consists of two screens. The partition attaches to the door frame by means of Velcro strips. The two screens close by means of strong magnets. 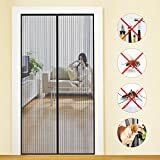 The partition is strong enough to keep pets and children inside the house, while keeping flying insects out. Bestope, Apalus, Markline, Absodeals, Homdox and Omgogo all make magnetic screen doors, using Velcro attachments and thumbtacks. 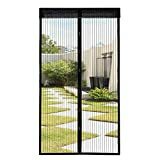 Aesthetically pleasing: The screen of the Markline Magnetic Screen Door is in the form of lace, making it both aesthetic as well as functional. Saves energy: Having a screen door can save energy as well: since you can leave your door open, you can get some cross-ventilation in your home. That means that you won’t need air conditioning or fans as much. Make sure that it comes with Velcro strips: Some sellers of magnetic screen doors don’t include Velcro. 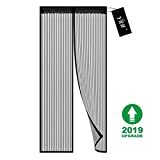 For example, some customers who bought the Markline magnetic screen door were disappointed when they found out that they had to buy their own Velcro to install it. 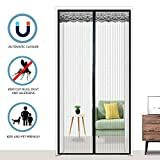 Not only for your home: The advantage of the magnetic screen doors is that you can easily detach them and put them up elsewhere: If you travel in a recreational vehicle, or go to a bungalow colony for the summer, you can take one of these portable screens with you, to protect you from flying insects. 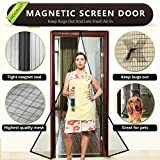 Magnetic door opens and closes hands-free: The two sections of the magnetic screen doors close by means of strong neodymium magnets. That way, the sections of screen close automatically--as long as the two edges of the screen are within a couple of inches of each other. Get the right dimensions: The dimensions of the screen door have to match those of your doorway. It’s suggested to measure the door dimensions twice, to make sure that you get the right size. Some brands will simply not work well unless it covers the entire doorway properly. Adhesive of the Velcro: The great thing about the magnetic screen doors is that they don’t require any tools to install them. But there is a drawback in some models: the adhesive of the Velcro strip may not adhere so well when the weather gets really hot. That might be a drawback to the magnetic mesh screens that attach to the doorway by means of adhesive. Easier Living--sells tools and home improvement devices. They sell the Magna Mesh Screen, as well as sofa repair kits, vent covers, rug grippers, and more. Absodeals--was established in 2014 to provide quality home and kitchen products. They make kitchen gadgets, aprons, magnetic screen doors, and more. 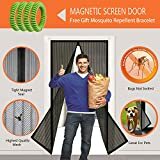 Their Magic Bug Screen is their screen door to eliminate flying insects. Apalus--is a maker of patio, lawn and garden products. They make insect traps, magnetic screen doors, mosquito repellant bracelets, and more. Bestope--is a seller of beauty and personal care products, such as makeup brush sets, as well as patio, lawn and garden equipment. They sell beekeeping gloves and suits, as well as a magnetic screen door. Homdox--are makers of home improvement and outdoors supplies. They also sell health and personal care products, and toys and games. They combine high-tech elements into their products. 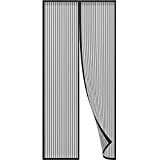 Their screen doors employ Velcro fasteners and magnetic seals.